Within Teamwork Projects, you can share filters from your project to a member of your team so that they can see the information you are seeing based on your applied filter, without having to save them. You can share filters for most aspects of your project such as tasks, milestones, messages, files, time, notebooks, risks, links and comments. The filter options will vary depending on the item you are filtering. Note: If you share a project filter with a user who does not have access to the project they will not be able to view it. To share an unsaved filter, set your filter requirements in the right filtering pane. You can then select the options button next to Unsaved Filter and choose share. If you have a some filter options or a saved filter applied, you will also have an option to share in the options (three dots) menu in the top right corner of the project area. 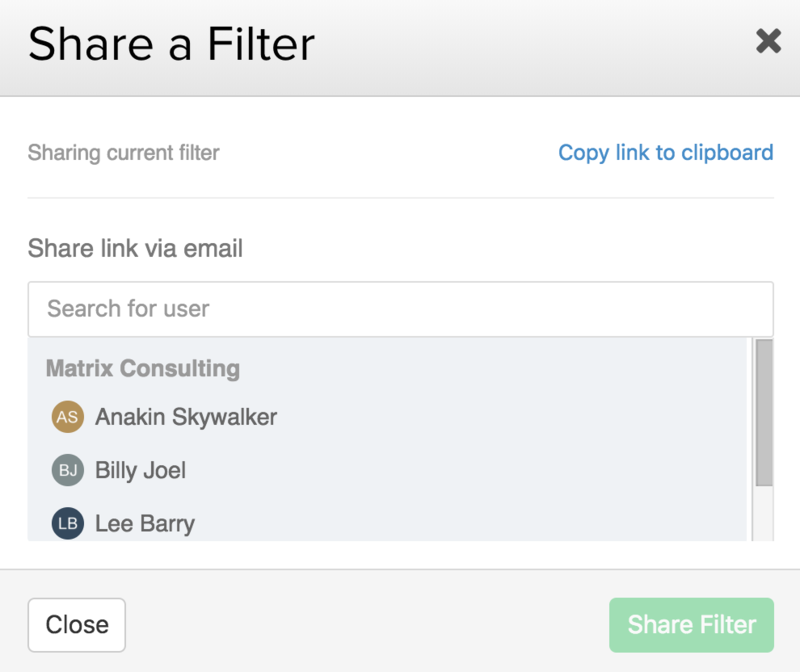 Once you have chosen one of these sharing options, you will then be able to choose who you want to share the filter with, in the share filter modal. There is also an option to copy to clipboard which allows you to share without the need to send an email. Note: Only users on paid subscriptions will have options to share filters.